Kate writes prolifically and contributes to numerous outlets on an eclectic array of topics, but her primary focus is the intersection of data, humanity, and meaningful experiences. Technology drives the future we create. But are we steering that technology in directions that create that future in the best way, for the most people? 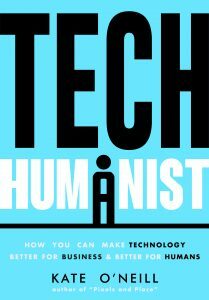 In “Tech Humanist,” Kate O’Neill examines the intent, goals and avenues through which people create and distribute technology, and the amplifying effects technology has on the values the organizations that deploy it. O’Neill defines a new model of business leader — the “tech humanist” — as developing honest assessments of organizational goals that move far beyond traditional P&L statements, and peer deeper into the consequences of everyday human experience design within our increasingly tech-driven culture. It’s the idea of using purpose as a strategy — defining organizational meaning, consequences and outcomes to align both business and human objectives — to spur making the world better by making the technology better. And it’s a role that needs to emerge as quickly and spread as completely as the new technologies it aims to harness for the common good, for both businesses and humans alike. The distinction between “online” and “offline,” between “digital” and “physical,” once seemingly unambiguous, has begun to blur thanks to the ubiquity of smartphones and personal location data, ad and experience targeting, connected devices, wearable technology, the Internet of Things, and additive capabilities like 3-D printing. The biggest business opportunities for innovative experiences, according to digital marketing expert and “Tech Humanist” Kate O’Neill, will come from blending the physical and digital worlds intentionally to create a meaningful and integrated human experience. And to do that, we must recognize that human motivations connect these worlds through a transactional data layer, and create experiences with respect for the humanity represented by that data. In looking at the opportunities presented by the convergence of physical and digital, O’Neill also examines the underlying meaning of place, as well as the abundant metaphors of place already in use in digital experience, and how we can shape our audiences’ experiences more meaningfully in alignment with our own business objectives. Executives, strategists, marketers, city planners, and anyone who creates experiences for humans will take away valuable insights from this book. As one of the movie giant’s first 100 employees, Kate O’Neill describes in this quick read the early culture and lists a few of the lessons she took away to start and run her own companies and advise others.